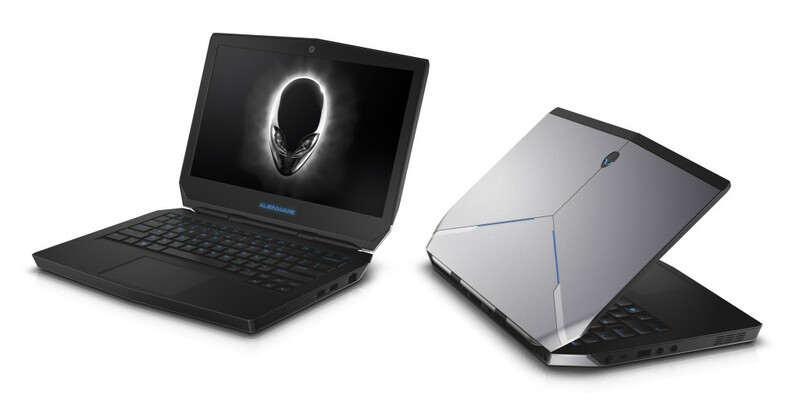 With the introduction of 11 and 14-inches, Alienware product line is expanded with Alienware 13, which is 13-inched PC. In addition to the above, Alienware 18 and Alienware 17 falls in this file. Dell is now following an interesting trend of making its device lighter and compact. Anyway Dell has its reputation in designing products with screen size less than 15 inches as in the case of Alienware M11x and Alienware 14. Well the new device Alienware 13 falls in the middle range. Two Dell Alienware 13 Non-Touch notebook computers. The official homepage of Dell shows three variants of the product.The cheapest one costs nearly $1269, which has an HD panel. The next higher version comes with a tag of $1390 with a Full HD screen. The most advanced version features a QHD screen. All other specifications remain the same for all the three variants. The RAM comes to be 8GB DDR3 and hard disk got the capacity of 1000GB. The most pleasing feature is Graphics Amplifier, which costs nearly $300. Now let us have look on all the features of the device. The design of the outer case is much appealing and pleasing. Thickness comes to be hardly more than 1-inch and weighs as light as nearly 4 pounds. The outer case is made of carbon fiber reinforced plastic which is usually used in aircraft manufacturing. It has a rubberized casing around the keyboard area. The strong hinges are capable of maintaining the display firm enough. It is above mentioned that the normal priced Alienware 13 has got a Full HD display. It is coupled with a screen resolution of 1920*1080 pixels to make it perfect. The IPS technology from Dell makes the screen display look good. The screen is supported with high contrast ratio. Due to the presence of matte surface, outside usage of the device won’t cause any problem even under bright sunlight. Black value with 0.32cd/m2 and luminance with 300cd/m2 are upto the mark. Colour space coverage measures to be 77% sRGB and 57% AdobeRGB, which are almost satisfactorily. Apart from other high end devices which uses 47 Watts CPU, Alienware uses 15 Watts one. The processor comes with Corei5-4210U, made on Haswell Architecture and performs with a speed of 1.7-2.7 GHz. This can execute nearly 4 threads at the same time whereas the quad core processor is able to do 8 threads at a time. The graphics on the PC is supported by HD Graphics 4400, which functions at a frequency of 200-1000 MHz. Dell utilizes switchable graphics, which could cut down power usage and ultimately increase battery performance. With low specifications if performs behind each and every high end devices. But the greatest advantage with 15 Watts device is that it will consume only a normal rate of power. When coming to the ports, it has got a USB port of v3.0 along with a microphone and a headphone port on the left side of the Laptop. On the backside of the device you may find ports for connecting Graphics Amplifier, Display Port and HDMI. Again on the right side of the device you may find 2 USB ports of v2.0 and one RJ45 port. The device can be connected to internet with the help of WiFi with a bandwidth of 802.11a/b/g/n. Along with this the wireless adapter also supports Bluetooth v4.0. Another important thing to be noted is the new ac-technology. About two years we were not able to imagine a high end game in 13-inched laptops.The Tomb Raider ran at 110 fps at 720 pixel when tested normally, but when tested in detail, it ran at 64 fps in Full HD resolution. Still it got an average of 31 fps with a minimum of 21 fps.While the Batman Arkham City functions with 61fps at normal, 58fps at high and 46 fps at extreme. When it comes to Metro-Last, it functions at 48fps at normal and 15 fps at extreme. When compared to other counterparts in market, it nearly reached their standard level especially those which functions on Core i7 Quad Core along with the support of GTX 960M. 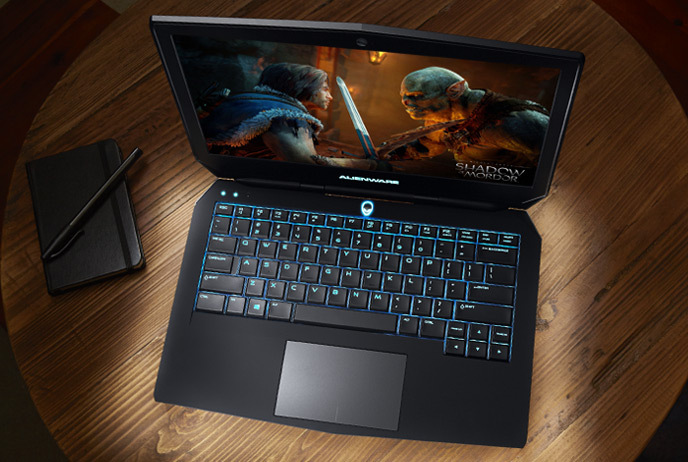 If you prefer to launch some more high end games, then Alienware Graphics Amplifier will come in aid for you. It is an external box which has a size of shoe case which helps in placing PCIe graphics card of user choice. It can be connected to the device with the help of proprietary multi-lane PCIe umbilical cable. The battery that makes Alienware 13 function, has got a capacity of 52Wh. It is made up of lithium polymer which is unfortunately not user replaceable. But it could give a power which can last upto 10 hours after a single charging. This could be something loved and liked by gaming folks. Since they want to play games uninterrupted without the problem of power shortage and lag in the game. When the performance of the device is compared to other similar devices, we came to the conclusion that Alienware 13 has got only medium performance levels. Certain other devices like Lenovo Y70 Touch, Maingear Pulse 15 and MSI GS70 Stealth Pro, are having much better performance level various components are considered. I am a Digital Marketer with a passion in SEO,SEM,Inbound Marketing & PPC. And i am like to explore new areas in digital marketing.